Get a hit of these blue crystal bath salts, created by Albuquerque's Great Face and Body, based on the smash TV series Breaking Bad. Or learn about other Bathing Bad products. You'll feel so dirty while you get so clean. Guaranteed to help you get high...on life. Go here to get Bathing Bad bath products! Click on Thumbnail for MapIn the quiet bayou town of St. Martinville, we happen into a story about the flight of the people who became Cajuns, and in the midst of their travails, the story of a beautiful woman searching vainly for her lost lover. It's an American tragedy, put to poem. To see where all this happens, click on the thumbnail of the map at right. ....Then there's Hollywood. The face on the statue, smooth and beautiful and untouched by madness or years of wandering the wilderness, is that of Dolores Del Rio, the Mexican-born actress who completed the trinity by playing Evangeline in the 1929 movie filmed nearby at Lake Catahoula." Statue of Evangeline in St. Martinville, Louisiana. Photo part of the French in America calendar set at johnfishersr.net. Click on photo to go to host site. To prepare for this post, I read the text of Evangeline, by Henry Wadsworth Longfellow. The story, which Nathaniel Hawthorne encouraged Longfellow to write, was written as a long poem in a meter, dactylic hexameter, that hearkened back to classical Greek and Roman poetry. The poem romanticized a period of Canadian and American history that, like many others, were in reality grounded in brutality. It is a romance set in the time when the Acadians of Nova Scotia were expelled from their villages by British forces with the tacit approval of New Englanders. The backdrop of these actions was international rivalry and conflict between France and England, and the French-speaking Acadians were in the crossfire. These actions occurred before the American Revolution, and sparked an exodus wherein the Acadians were forced to spend years in exile. Some went to other parts of what is now Canada, and others settled in areas of the United States with a large number making a home in the bayous of Louisiana. The term "Acadian" over time became "Cajun." Longfellow's poem was a sensation when it came out in 1847. Not only is it an easy poem to read, but it tells of a long-suffering woman who searches for her lost love after being forcibly evicted from the Nova Scotian village of Grand Pré (which really exists, by the way), finding him only when it is too late. It is a romantic tragedy. Longfellow never stepped foot in Louisiana, relying instead on what others told him and on a precursor of the motion picture, Banvard's moving panorama of the Mississippi River. These panoramas were paintings wound around scrolls and then unfurled to give one the impression that he or she was traveling through the depicted scenery. Subsequent scholarship has indicated that Longfellow may have gotten some details of historical accuracy incorrect, but it also provided the United States with a piece of literature that compared favorably with other similar poetic epics from Europe and other places, and it gave peoples of Acadian descent with a heroine they could call their own. Urged on its course by the sinewy arms of hunters and trappers. Northward its prow was turned, to the land of the bison and beaver. At the helm sat a youth, with countenance thoughtful and care-worn. Somewhat beyond his years on his face was legibly written. Sought in the Western wilds oblivion of self and of sorrow. Angel of God was there none to awaken the slumbering maiden. Swiftly they glided away, like the shade of a cloud on the prairie. Said with a sigh to the friendly priest, "O Father Felician! Something says in my heart that near me Gabriel wanders. Is it a foolish dream, an idle and vague superstition? Or has an angel passed, and revealed the truth to my spirit?" Then, with a blush, she added, "Alas for my credulous fancy! Unto ears like thine such words as these have no meaning." "Daughter, thy words are not idle; nor are they to me without meaning. Is as the tossing buoy, that betrays where the anchor is hidden. Therefore trust to thy heart, and to what the world calls illusions. On the banks of the Têche are the towns of St. Maur and St. Martin. There the long-absent pastor regain his flock and his sheepfold. They who dwell there have named it the Eden of Louisiana." "Be of good cheer, my child; it is only to-day he departed. Foolish boy! he has left me alone with my herds and my horses. Could no longer endure the calm of this quiet existence. Unto the town of Adayes to trade for mules with the Spaniards. I have been known to get like that myself - dark, brooding, lost in my own self-pity rather than taking positive action and steps that might lead me to new things or help me find things that I've lost. Instead, as is usual, the initiative is up to Evangeline, and she follows Gabriel, finding where he has been but always missing him by a few days. Her travels take her to the Ozarks, up to Michigan, and finally, as an old, sorrow-filled woman, to a convent in Philadelphia where as a Sister of Mercy tending to the sick and lame, she finds Gabriel in a bed breathing his last. As in the days of her youth, Evangeline rose in his vision. Vanished the vision away, but Evangeline knelt by his bedside. Died on his lips, and their motion revealed what his tongue would have spoken. Kissed his dying lips, and laid his head on her bosom. As when a lamp is blown out by a gust of wind at a casement. The poem is well worth a read and does not run on for hundreds of hundreds of pages, like the Iliad, Odyssey or any of the other epic poems you might have been forced to read sometime in your schooling. Unfortunately, in my own travels I passed near to St. Martinville but never got to the town. I would have liked to have seen the statue that LHM refers to - the one representing the supposed real-life Emmeline Labiche, whose story inspired Longfellow. Scholars now think that Emmeline also was fictional. 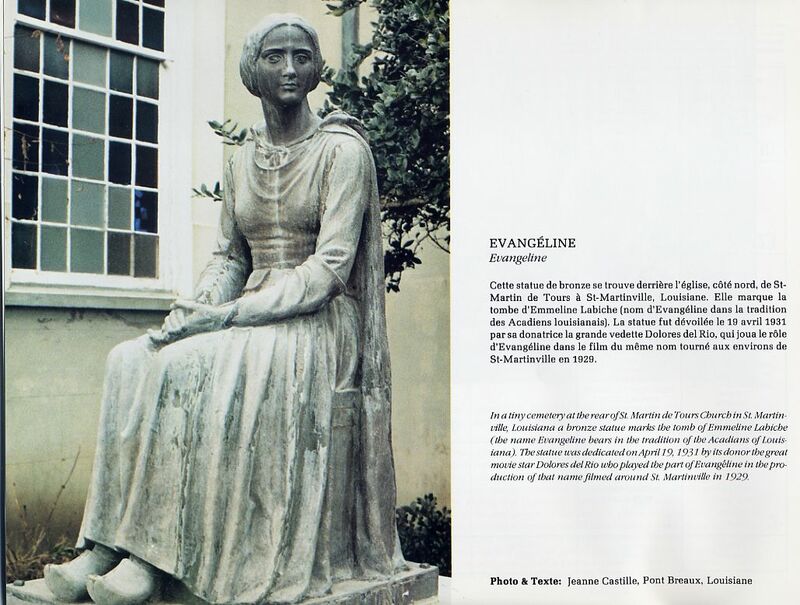 The statue also symbolizes Evangeline herself. The model for the statue was Dolores Del Rio, the first true Latin American movie star with an international following. After portraying Evangeline, Del Rio modeled for the statue as a thank you to the town of St. Martinville and the residents there. There you have it, Littourati. For a piece of American history that is immortalized in poem, visit St. Martinville. In the surrounding swamps and bayous, you too can imagine a beautiful woman, lost, looking for her true love, still convinced that she will find him and make a life with him. Around you, the bayous move slowly, languidly, unconcerned about the affairs of men and women. Time stands still - then a pirogue may appear with a Cajun hunter and glide slowly and silently by before disappearing into the cypress. At this moment, you might feel Evangeline's loneliness, and the isolation of the Cajuns down at what seems like the end of the world. Copyright © 2010-2013, Michael L. Hess. All rights reserved.